HONEY AND HEMLOCK: The Mystique of Hitchcock's "Psycho"
Alfred Hitchcock’s Psycho was released in the summer of 1960, and in the half a century since, it has become the rare movie in which every image and detail and motif is now, more or less, iconic. Every moment in the movie is a piece of mythological Americana. 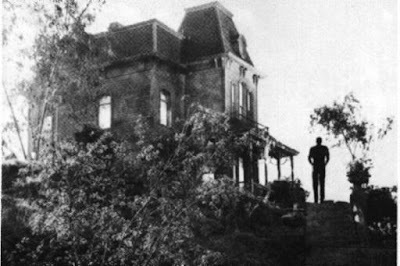 You could easily claim that Psycho, more than any other film, is the movie that changed movies — that it broke down, and reconfigured, popular storytelling by shifting it from a form in which lives were orderly and cohesive, bound by the symmetrical conflicts associated with classic Hollywood, to one in which lives were loose, random, unpredictable, and violent, subject to the messiness we associate with the Hollywood films of the ’70s, after the collapse of the studio system. Yet the most measurable and seismic effect that Psycho had was on the horror genre itself. Before Psycho, horror movies were “monster” movies. They were fantasies in which men battled supernatural creatures — or turned into them.... Here was a horror film in which the “monster” lived inside the head of one man — poor, schmucky, fearful Norman Bates, the mama’s boy with a black secret. In truth, there was no monster at all, no shrieking outsize “mother.” There was just Norman and his rage. Yet Hitchcock’s genius is how deftly he created the illusion of a monster. The Bates house, that looming Gothic mansion full of cryptlike rooms and stuffed birds, was, in effect, a symbol of old-fashioned 19th-century terror. It was a Hollywood funhouse with a secret trap door. Once inside the house, Hitchcock, drawing his camera back and up, up, up high, teased the audience with a great Freudian metaphor. Though he never, right up until the end, let us get close enough to see Mrs. Bates, what we did see was Norman carrying her around — which, of course, is exactly what the real monsters of our time do. They carry their demons around, making them real, becoming slaves to them instead of mastering them. They become souls in demon drag. By making the audacious claim that the darkest monsters — brutal, homicidal, and unknowable — live directly inside us, Alfred Hitchcock, in the grandest stunt of movie history, did more than kill off his heroine. He made a show of killing God; he expressed the horror of a world that had seen enough real horror (the trench slaughter of World War I, the Holocaust, the dropping of the A-bomb) not to need any more monsters. And that’s why the horror films of today are forever in his debt, and in his shadow. Every time you see a slasher movie with Jason, Freddy, Leatherface, or whatever new name they come up with for some masked lunatic with a big blade, you’re watching a remake of Psycho, an attempt to recapture its fear and insanity. But, of course, that can never happen again. Because now we know what’s coming. The movies, it turned out, could only kill God once. Why Psycho is a movie you can watch again and again and again, Part I. Movies, now more than ever, are comfort food; they reassure us with the familiar... Yet movies can also be darkly artful adventures into the heart-stopping unknown. Psycho, uniquely, is both at once. It turns order into chaos, taking ’50s small-town conformity on its trippiest ride. At the same time, it serves up murder, insanity, and the abyss with a puckish playfulness, a formality that says, “Have no fear — this is the new order.” And it was. Psycho is a movie that turned the familiar inside out, in the process sowing the destruction of the very studio system that produced it. To watch the film is to be at once profoundly unsettled and ticklishly reassured, and that’s a singular combination that keeps drawing you back. The shower scene expresses one fear that is seldom talked about. It’s not just the shock, savagery, and timing, the “78 pieces of film” (as Hitch liked to describe it). If you look at the shower scene literally, it’s a fearsome vision of a “woman” — faceless, gnashing, ramrod-straight — who has absorbed a man’s power. Mrs. Bates, with her taunting rebukes and homicidal rages, is a nightmare image of the America then on the horizon, in which women would now be as powerful as men. Why Psycho is a movie you can watch again and again and again, Part II. It’s the way that Hitchcock places the audience at the center of the movie. At first, we identify with Marion. Then, in the single most revolutionary act in the history of Hollywood cinema, Hitchcock takes the main character of what appears to be a classically structured, three-act narrative and literally cuts her out of the picture. What does the audience do then? There are a lot of theories about this (David Thomson meditates on it thoughtfully in his 2009 book The Moment of Psycho), and the most conventional is that our sympathy shifts over to poor, beleaguered Norman. The truth is that it shifts around — from Marion to Norman to the detective to Lila and Sam. Finally, though, we rise with Hitchcock’s camera above all of them, merging — literally — with the director’s omnipotent view. As that happens, the mystery at the heart of the film (who’s doing the killing?) draws our emotions like a cosmic magnet. The mystery becomes, in effect, the main character, and we merge with that mystery. Why it really is about the death of God. Like just about all the greatest movies, Psycho works on the level of myth. It starts out as a faintly chintzy morality play in which Marion Crane, though she made a big mistake, will presumably be chastened, redeemed, protected, and rewarded by a universe that saves those who save themselves. It turns into a movie in which no one — not even a sinner who repents — will be saved. And that, for the first time in Hollywood, is a truly godless world. Psycho cleaves the 20th century in half: It turns order into madness, ushering us into a new way of seeing, of being. Yet the movie’s ultimate paradox — it’s there in the final shot of the car being dredged out of the swamp — is that it lifts us up by dragging us down. Its monster is all too brutally real, yet at the same time that monster is just a ghost — “Mrs. Bates” doesn’t even exist. So why does it trouble our sleep so when she goes bump in the night?